This dear little church sits at a crossroads along the Halesworth to Harleston road. In centuries past it was probably a more important place than today, a meeting of ways in the woods. Although the road can be busy, these are peaceful parishes, fairly depopulated in comparison with a century and a half ago. It is unlikely that the money spent on their 19th century restorations would be so easily found today. Parva in a place name means 'lesser', and its popularisation is really a Victorianism, although it was in use before that. The Parva village here is larger than the Magna (greater) Linstead, which is now very small indeed. 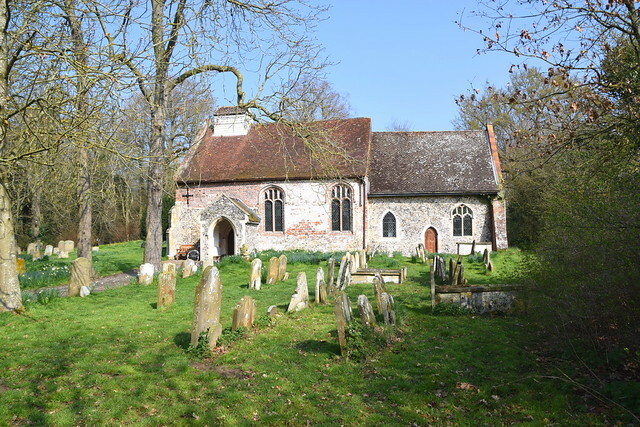 The church of St Peter, Linstead Magna, has now completely disappeared, although there are some remains of it here at St Margaret. 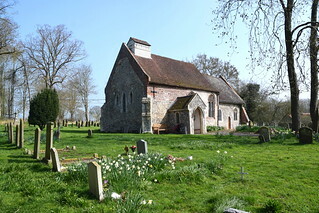 St Margaret of Antioch sits in a pretty churchyard, with large and abundant trees all around. They form a tunnel effect as you approach the south porch, although this has been ameliorated in the least couple of years because the two large horse chestnuts nearest to the church have been cut down. The church has no tower, just one of those curious little Victorian turrets. 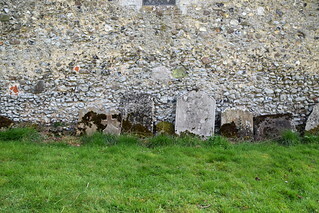 Against the west wall lean broken gravestones from the 18th and 19th centuries. They were rescued from the lost churchyard of Linstead Magna in the 1980s. You step inside to a well-ordered coolness. This is a prayerful place, which of course all churches should be, though some of them aren't. An ancient place too, a 13th century church that wasn't updated much in the centuries afterwards until the late Victorians came along and laid a heavy hand on it. In fairness to them, the church was probably near-derelict by their time. They refurnished the nave with their benches, but there are a couple of reused medieval bench ends stuck on the shorter benches towards the west. I'm told that they came from St Peter at Linstead Magna, and were probably brought here at the time of th 1890s restoration. This is interesting, for a reason we will come to in a moment. On the end of one there is a splendid fellow saying his rosary, the beads hanging from his hand. 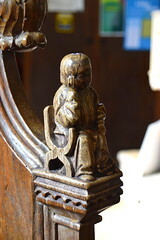 When you look closely you can see that he is falling asleep, and he was probably one of a set depicting the Seven Deadly Sins, either Pride or Sloth. He did rather well to escape the attention of the reformers. The font is equally interesting, because it clearly did not come from this church at all. 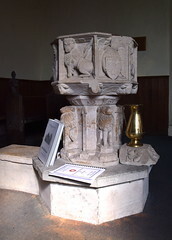 Like many older octagonal fonts in Suffolk, it has one blank side, suggesting that it once stood against a column in the arcade, as once many did. But, of course, that cannot be, because this church doesn't have an arcade, and never has had. 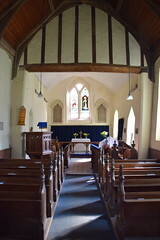 The 1920s church of St Augustine of Hippo in east Ipswich is supposed to contain the font formerly in St Peter, Linstead Magna. 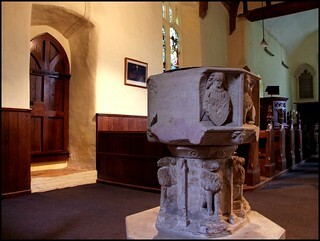 But Sam Mortlock suggests that St Peter's old font may actually be this one, here at St Margaret. 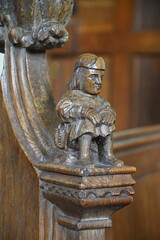 Perhaps it came here at the same time as the bench ends, in which case St Augustine may contain the old font from St Margaret. Munro Cautley, the church antiquarian, writing just ten years after the demolition of St Peter, insists its font went to Ipswich. However, it is worth noting that he was diocesan architect at the time, and was responsible for the design and building of St Augustine. Though why he would have wanted to have left a false trail I don't know. 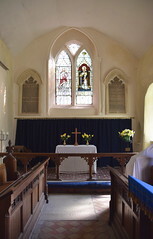 The 19th Century glass in the east window is an oddity. It depicts St Peter and St Paul, but the styles of the two are quite different, and they clearly came from different workshops, perhaps even collected from different churches. St Paul appears to be by Ward & Hughes, St Peter perhaps the older piece of the two. His face is apparently taken from the life of a serious Victorian gentleman, and if so I wonder who he was, and if this was the church in which he believed he would be commemorated.